A commercial space company has revealed the design of the lunar lander that it aims to send to the moon in 2015. California-based Moon Express unveiled the blueprint and first images of its MX-1 lunar lander today (Dec. 5) in Las Vegas, during the last day of the Autodesk University computer-aided design conference. In addition to delivering payloads to the lunar surface, the coffee-table-size MX-1 could also help service satellites, deploy tiny "cubesats" in Earth orbit and clean up space junk, company officials say. Moon Express designed the MX-1 from the ground up, Richards said. When fully fueled and ready for launch, it will weigh just 1,320 pounds (600 kilograms), with rocket fuel constituting more than 75 percent of the mass. To make the lander so light, engineers employed composite materials and did away with the typical "bus," or structure that supports most spacecraft. Instead, the MX-1's fuel tanks serve as the structure, Richards said. "With that, we got rid of a huge amount of mass," he said. The MX-1's main rocket engine will burn hydrogen peroxide, though it also relies on kerosene as an afterburner to accelerate out of Earth orbit and head toward the moon. The lander will be capable of delivering 132 pounds (60 kg) of payload to the lunar surface. Unlike the landers NASA developed during the Apollo program, the craft has no legs; instead, it will land slowly and softly on one of its empty fuel tanks, whose collapsibility will cushion the blow. 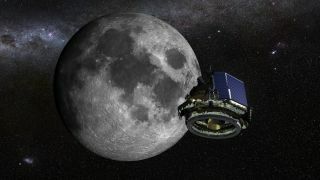 The MX-1's maiden moon flight is slated to occur in late 2015 as part of the $40 million Google Lunar X Prize, an international challenge to land a robot on the lunar surface, have it travel at least 1,650 feet (500 meters) and send data and images back to Earth. The first privately funded team to do all of this by the end of 2015 will receive the $20 million grand prize. An additional $20 million is set aside for second place and various special accomplishments and milestones, bringing the prize's total purse to $40 million. Moon Express — one of 22 teams still in the running — wants to win the grand prize, but its ambitions don't stop there. The company aims to make money flying commercial and government payloads to the moon, and it eventually wants to extract water and other resources from Earth's nearest neighbor, both to benefit humanity on its home planet and to help our species extend its footprint out into the solar system. Moon Express has already started building the MX-1, Richards said, and aims to have an engineering prototype ready for a test flight on Earth by May or June of next year.